This concise textbook is ideal for any student or health care professional who needs an authoritative, readable, affordable text that is sharply focused on clinical psychiatry. 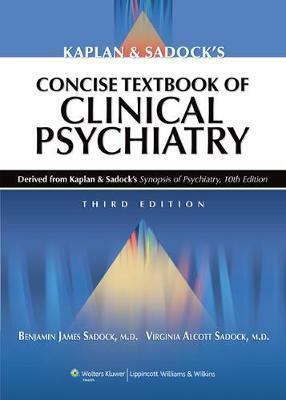 It contains the most relevant clinical material from the best-sellingKaplan and Sadock's Synopsis of Psychiatry, Tenth Editionand includes updated information on recently introduced psychiatric drugs. The book is DSM-IV-TR compatible and replete with case studies and tables, including DSM-IV-TR tables. Chapters offer step-by-step guidance on the clinical examination, the psychiatric report, medical assessment of the psychiatric patient, laboratory tests, and signs and symptoms. The major portion of the book covers all psychiatric and substance-related disorders, with special chapters on children, adolescents, and the elderly. Also included are chapters on emergency psychiatry, forensic psychiatry, ethics, and palliative and end-of-life care.